An unnamed Northern Virginia police agency has apparently scored itself a Nissan GT-R to use as a pursuit vehicle. Call it the last of the V6 Interceptors. 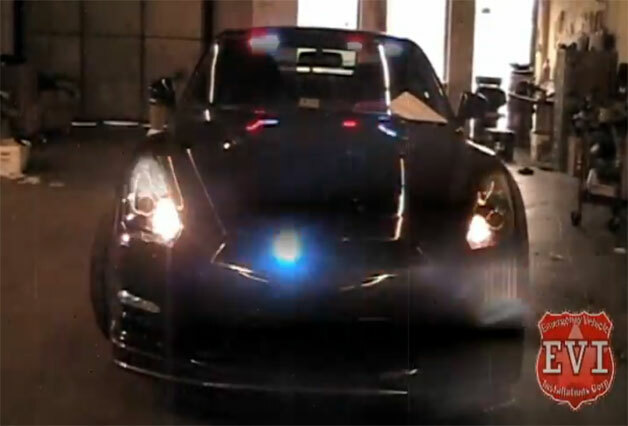 A company by the name of EVI Corporation spends its days outfitting law enforcement vehicles with all of the necessary electronics to track down baddies, and the company recently released a video showing a GT-R boasting a full range of blue and red flashers as well as the standard strobe treatment for both the headlights and taillights. Now, we've seen agencies snag high-dollar vehicles from drug kingpins and other seedy characters in the past, but this is something different. According to the word kicking around the web, this GT-R showed up at EVI with a mere 20 kilometres on the clock, meaning its as fresh as a fallen snow flake. The only question is; which law-enforcement agency in the area (if any) saved up enough pennies to buy itself a Nissan GT-R for pursuit or public relations duty? EVI isn't saying for obvious reasons, but we're guessing it won't be too long before this machine gets its cover blown. Hit the jump for a video of the car with its lights blazing. lol, if only this actually existed as a opp.